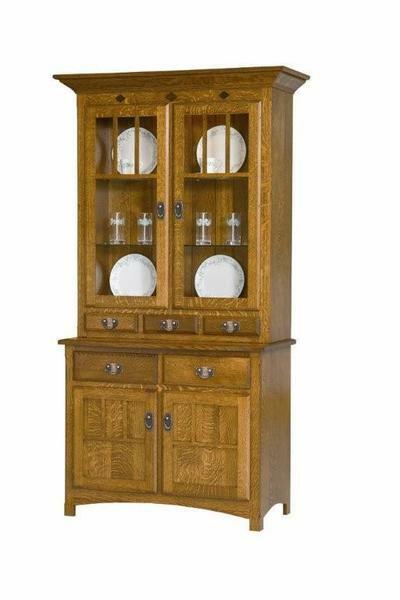 This beautiful Amish china cabinet is handcrafted from the finest solid hardwoods such as oak, quarter sawn white oak, cherry and walnut. The cabinet drawers feature dovetail joints, full extension soft closing drawer slides and the hardware is of the highest quality. The display top of the Royal Mission Hutch features three display levels placed on top of three small additional drawers. The buffet base features two larger drawers and a spacious 2-door storage space. The Royal Mission 2-Door Hutch is carefully crafted from top to bottom; whether it's the detail molding on top of the rich diamond inlays, every cut is flawless. If you have any questions, don't hesitate to call us at 1-866-272-6773. We have helpful Amish furniture specialists that you can speak to over the phone or meet in person at our store in Sarasota, Florida. We would love to meet you either over the phone or face to face in our brick and mortar store. See you soon!